Can you say C-U-T-E?? 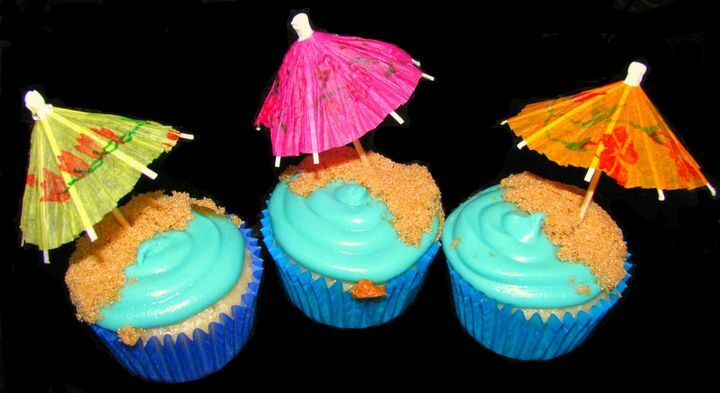 These adorable vegan coconut cupcakes will send you straight back to shore! Well, vicariously. I made these for my niece and nephew, ages 4 and 2, consecutively, and they loved them! I brought the remaining ones to work the next day and at the rate they disappeared, I’m sure nobody took a second to miss the eggs and dairy! Melt butter slightly in the microwave. I like it pretty runny because it’s less difficult to mix the sugar into. Mix all ingredients together in a medium mixing bowl except the food dye. Make sure there are no lumps – I recommend using a wooden spoon or a stand mixer if you have it. Once your frosting is mixed well, add as much food coloring as you want to make it as light or dark ocean blue as you wish. Place in fridge to keep it chilled or it will run all over your cupcakes when you try to frost them if left at room temp. And that would be sad. Preheat oven to 350 degrees F. Fill cupcake pan with liners. In a large bowl, mix together the flour, sugar, coconut, baking soda, and salt. Add in the rest of the ingredients, adding the vinegar last. Stir until well combined. Pour into cupcake liners in a cupcake pan and bake 30 minutes, or until centers come out clean. Remove from oven and allow to cool completely before frosting!! No melted frosting allowed! :-) I suggest placing the cupcake pan with the freshly baked cupcakes into the freezer for about 10-12 minutes. Don’t freeze them, but the freezer usually cools them down quicker if you’re in a rush. Vegan Lemon Pound Cake Cupcakes! Mmm! These come out best if you use sweetened coconut and a little coconut extract to up the coconut factor!